IRVING, TX (KPLC) – The College Football Playoff committee will have some Louisiana flavor for the upcoming football season. The committee announced Wednesday that former Texas A&M coach R.C. Slocum has been appointed to the selection committee by the CFP Management Committee. The Oakdale native and McNeese alum will be joined by General Ray Odierno, a former Army Chief of Staff, and Arkansas State athletic director Terry Mohajir. The new members will each begin a three-year term starting this spring. The trio replaces Jeff Bower, Herb Deromedi and Bobby Johnson on the committee whose terms expired. “Terry, Ray and R.C. each bring a wealth of experience and expertise to the committee,” CFP executive director Bill Hancock said in a statement. “All three have built esteemed careers based on character and diligence, which will continue the CFP tradition of committee members who are football experts and also people of high integrity." Slocum was inducted into the College Football Hall of Fame in 2012. 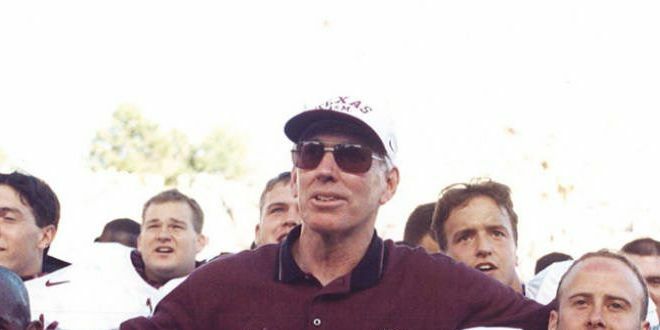 The winningest head coach in Texas A&M history, he led the Aggies to a record of 123-47-2 from 1989-2002. Slocum earned both bachelor’s and master’s degrees from McNeese, where he played football from 1963-67. Upon graduation, he began his career as a football coach at Lake Charles High School in Louisiana, before transitioning to the college ranks at Kansas State from 1970-71. Slocum then was hired by Texas A&M as an assistant coach, where he spent the 1972-80 seasons prior to becoming the defensive coordinator at the University of Southern California in 1981.